Five highly recommended books which should be in the library of all critical criminologists. All are great reads. Each one is available second hand on Amazon marketplace for 1p. You have to pay a further £2.75 p&p but given the size of a couple of these that is not bad. 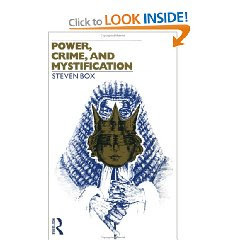 One of the classics of radical criminology - a compelling account of how power and powerlessness operate within the criminal justice system. The author looks at the experiences of a group of young offenders on a probation programme in Britain, looking at individuals, the crimes they have committed, their circumstances and the problems they face. For all of these there are a number of 1p copies but these can sell out.